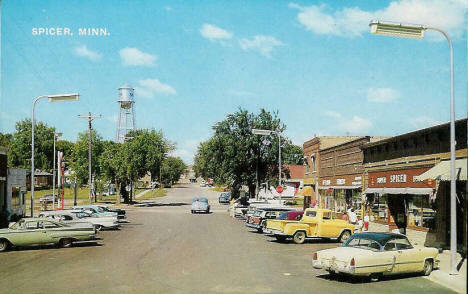 Do you have photos, historical accounts or other items pertaining to the Spicer area? Would you like to share this historical information with the world? LakesnWoods.com would like to publish your Spicer photos (current or historical) or historical accounts on this website. Original materials can be returned and your privacy will be respected. Northeast of Willmar on Highway 23 is the picturesque city of Spicer, nestled on the shores of beautiful Green Lake—one of the state’s most popular bodies of water. Spicer is a thriving tourist center with county parks, antique stores and unique gift shops to browse. On top of that, there are also restaurants with atmosphere and great food to experience. 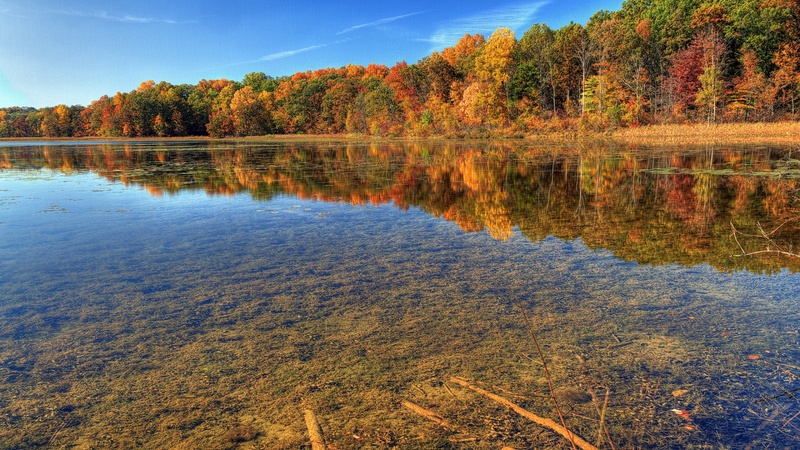 The area offers multiple lakes, woods, parks and resorts to enjoy almost any outdoor activity. “Spicer really is nicer” regardless of what the weather brings. In the wintertime, there are plenty of trails to explore on cross country skis or by snowmobile and the famous Spicer Ice Castles are always a spectacular sight to see on Green Lake. During the warmer months, you’ll find the residents and locals enjoying boat cruises, casting out a line, browsing a flea market or taking a dip in one of the many lakeside shores. Spicer’s amenities combined with the friendly nature of the community make it a wonderful place to visit or call home. Spicer is a city in Kandiyohi County, Minnesota. 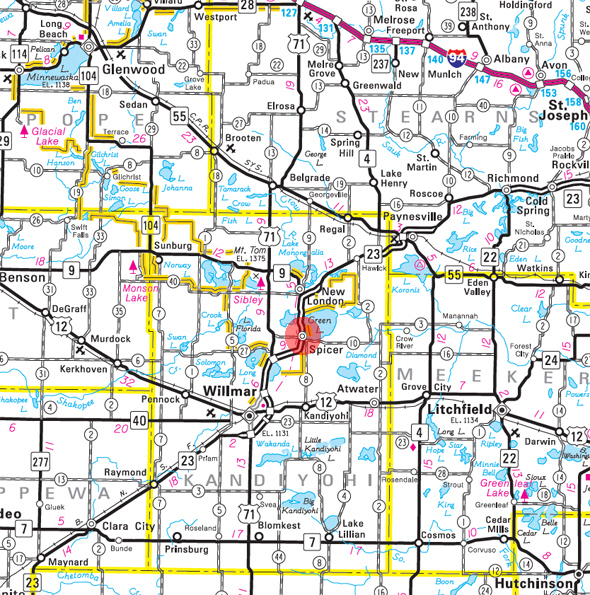 Minnesota State Highway 23 serves as a main route in the city, and U.S. Route 71 is nearby. According to the United States Census Bureau, the city has a total area of 1.15 square miles (2.98 km²), of which, 1.14 square miles (2.95 km²) of it is land and 0.01 square miles (0.03 km2) is water. The elevation is 1,171 ft (357 m) above sea level. As of the census of 2010, there were 1,167 people, 520 households, and 312 families residing in the city. The population density was 1,023.7 inhabitants per square mile (395.3 /km2). There were 621 housing units at an average density of 544.7 per square mile (210.3 /km2). The racial makeup of the city was 98.2% White, 0.1% African American, 0.4% Native American, 0.2% Asian, 0.2% from other races, and 0.9% from two or more races. Hispanic or Latino of any race were 4.1% of the population. There were 520 households of which 27.3% had children under the age of 18 living with them, 47.7% were married couples living together, 9.6% had a female householder with no husband present, 2.7% had a male householder with no wife present, and 40.0% were non-families. 34.8% of all households were made up of individuals and 15.7% had someone living alone who was 65 years of age or older. The average household size was 2.20 and the average family size was 2.85. The median age in the city was 40.4 years. 22.7% of residents were under the age of 18; 7.1% were between the ages of 18 and 24; 25.3% were from 25 to 44; 26.1% were from 45 to 64; and 18.9% were 65 years of age or older. The gender makeup of the city was 48.8% male and 51.2% female. SPICER, a city of Green Lake and New London Townships, was platted in 1886 on the deserted early townsite of Columbia and was named in honor of John M. Spicer, its founder and owner of the site, who was the president of the company building the railway line. Raymond village was named for his son, as before noted. It incorporated as a village on June 10, 1904; the post office was established in 1886 with Burton B. Swetland as postmaster in William Olson's general store, Olson being the first merchant and operator of a tourist passenger boat on Green Lake; it had a Great Northern Railway station in section 3 of Green Lake Township. The Spicer Business Directory is Coming Soon!